Team April is spreading, not only across the country, but across sports and species! Last weekend a team of dressage riders -- whom I don't even know personally, all the way across the country in Maryland! -- wore my name in the PVDA Ride for Life, benefiting the John Hopkins Breast Cancer Center. The team was headed up by Cherie Chauvin and her handsome boy Katchi of Golightly Sport Horses. Cherie heard about me & my cancer slaying from our mutual friend, Sylvia -- Sylvia who is Cherie's friend from college and my friend from junior high. Cherie put the team together, and all four riders wore my name as they rode and competed. Amazing! Cherie has more pictures and some really fun videos on her blog, here. Meanwhile the President of Team April, Joe (who doesn't get nearly enough play on the blog but is always, always here for me in so many different ways!) sent me some great video clips to keep me in the warrior spirit going into FEC-H. I especially like this one from Crouching Tiger, Hidden Dragon: badass Michelle Yeoh with her multitude of weapons is my chemo: so many weapons/drugs in my body right now: 5 FU + Cytoxin + Epirubison + 3x my regular dose of Herceptin (not to mention all the pre-meds and post-meds). 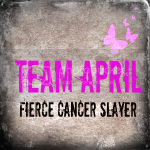 So many weapons to fight this one tricky cancer!